These protection right's are given to the four terminals that voted for teamsters representation. And they don't pay any UNION DUES yet. What are the rest of you waiting for? 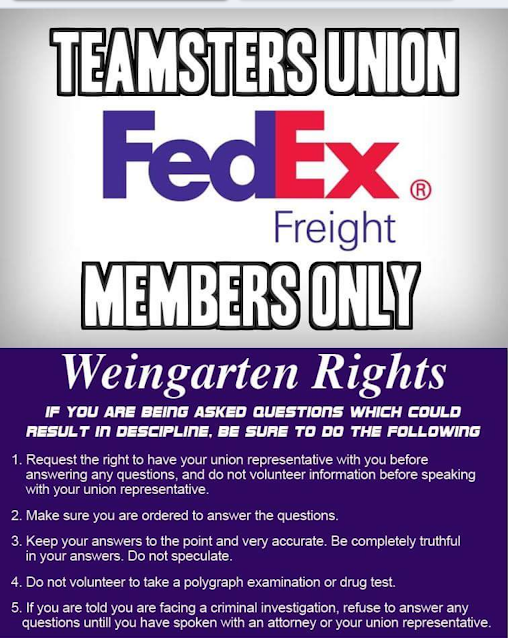 Congratulations on all your hard work in procuring the greatest union on the planet to Fed Ex. As an ex-employee of 25 years and now a proud member of the Studio Teamsters Local 399, I look forward to all my brothers and sisters from Fed Ex Freight formally (Viking Freight System) in having the opportunity to raise their living expectations,security,attitude and have a sense of pride of [really] being a member of a family, a group, organization, that really has your back,and not that lie Fed Ex preaches as you are lead out the door with nothing but empty promises that never come to fruition. Thank You Mike for your comment and congratulations on your new job. Representation is needed at FedEx Freight Whittier. I have seen the injustices at this terminal and can no longer continue to do or say nothing about it. I'm curious to know how many people from FedEx Freight WHT are interested in organizing? If enough people are involved I would love to be part of this movement.